SweetStamps.com is looking for crafters to fill Design Team positions for a four month term starting February 1, 2011. We are seeking parchment crafters, card makers and scrapbookers. • Welcome package includes 12 stamps of your choice, 3 Shades™ ink pads or re-inkers and other goodies based on your interests. • You will receive a 25% discount on purchases from our online store or booth. • Product allowance of $25.00 per month after your first month of service. • You will have access to new stamp designs and products first. • National exposure: have your creations displayed in our booth at well attended trade shows, along with SweetStamps.com’s blog, website and advertisements. online gallery that includes product links to our online store. • Participate in all monthly challenges and blog hops. • Mail six completed projects at the end of your term including a complete supply list. • Email good quality photos of your projects without a watermark for use on our website, catalog or printed materials. • Promote SweetStamps.com on your blog with a DT badge and list fellow DT member’s blogs. • Leave occasional comments on DT members blogs and the company blog. Email scans or blog links of three of your best projects showing your style to stacey@sweetstamps.com with the subject line SweetStamps.com DT Call. The team will be announced and contacted by email or phone by January 23rd. Here is one of the wonderful make and takes we did using dies from Cheery Lynn Designs and stamps and ink from Sweet Stamps at the Open House Friday and Saturday. We started with the blue panel which was die cut with Cheery Lynn Designs largest die from the Scalloped Rectangle Card-Maker's Nesting Dies. We embossed this panel with the fabulous new Snowflake Flurries XL embossing plate, running white dye ink over the raised areas. Isn't it beautiful? Using the largest die from the Little Stackers French Flair Nesting dies, turning it on point, we cut the opening in the embossed panel as well as a second French Flair from white card stock. Vellum was added to the back of the opening and the Sweet Stamps 8033 - Crystal Snowflake was stamped with Shades Aquamarine dye ink and heat embossed with Diamonds and Pearls embossing powder. It really shimmers! 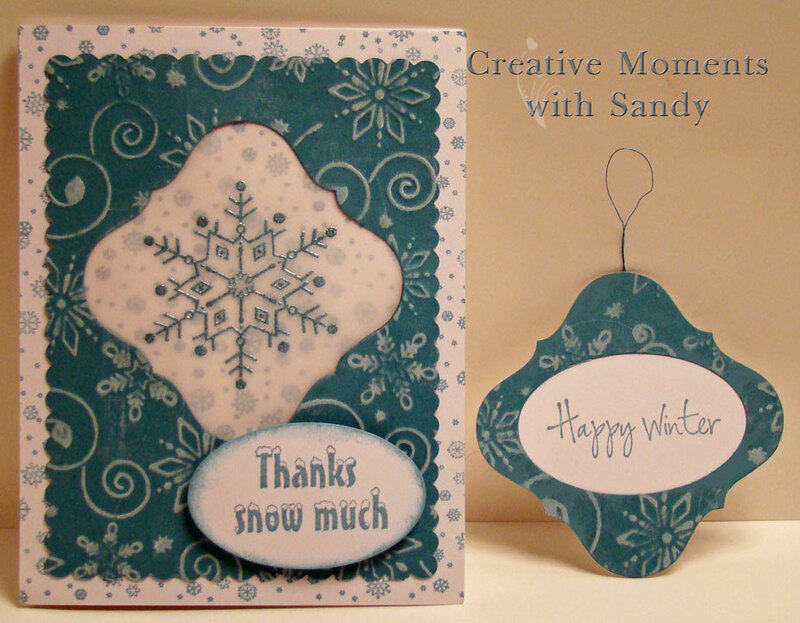 The background panel was created using Sweet Stamps 8022 - Tiny Snowflake Background stamped with Shades Tidal Wave dye ink. Using a die from the Little Stackers Oval Nesting dies, we cut an oval in the center of the ornament as well as an oval from white card stock. On the white card stock oval, we stamped 9103 - Snow Thanks with Tidal Wave dye ink, distressing the edges with the ink as well. This was added to the card with pop dots for some dimension. Next we added a hanger to the French Flair ornament, then adhered the white card stock French Flair to the back of it. The last step was to stamp 8028 - Happy Winter in the opening on the ornament. What a fabulous card with a wonderful little ornament enclosure.